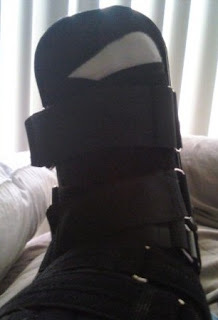 That's right; I recently suffered my first broken bone, and it's a doozy -- a Jones fracture, a fifth-metatarsal fracture that the physician assistant who first examined me was kind enough to tell me is "the worst kind of fracture you can get in your foot." The first day and a half was hard as I tried to get through -- and to enjoy -- Homecoming at Central Michigan University (and in all honesty, I probably should've just stayed home; I was in bad shape!). After that, I was bound to my couch for several days, moving only to use the restroom or get something to eat or drink. If you're an on-the-go person who's ever had a foot or leg injury, you know how horribly maddening this is. And I also have a walking cast (a "boot") that allows me to actually use my foot and has, in less than two weeks, clearly facilitated a heck of a lot of healing in my foot. I love the boot! But in all seriousness -- just for a moment -- scroll back up to that picture of me on crutches. Look at me, at age 31, with my first broken bone ... and remember that I don't have a job. But I have insurance, thanks to my decision to pay for COBRA benefits (which were made affordable thanks to the federal government's 65 percent subsidy of COBRA). Let this be a lesson to you: If you lose your job, don't lose your health benefits! Find a way to pay for COBRA, even if it means shutting off your cable (that's a big chunk of how I pay for mine) or giving up something else unnecessary. The monthly checks I've written for the last several months are paying off in a big way right now as I see doctors, have X-rays taken, and rent/purchase costly medical equipment ... all of which is covered by my insurance. Protect yourself, because the impossible and unlikely can and just might happen!